Replaced them with Gelid Wing 120's a few years ago. At that time you could buy a 4 pack of Gelids, which I did, used 2 in my Son 3, 1 in another build, still have a new one left (somewhere lol). These fans are a good bang for the buck. There are cheaper louder ones, and there are slightly quieter ones but you have to pay alot more for. The speed variables is nice, but I dont find the air flow changes that much. They were easy to install in the P280s i used, and have both 3 and 4 pin molex connectors which is nice, although not many things use molex anymore. Would purchase again. I live by these fans. At the price point there is no reason to get anything else. They perform very well and last many years. Cons: Not good for radiator setups. Have 4 TriCools in my current build. 3x120mm (1 intake, 2 exhaust by radiator) and 1x200mm.The TriCool 120mm is very quiet at medium at 28dB but gets louder on high at 29-30dBa.However I don't recommend this as intake/exhaust for radiators as it does not push enough air. In the future I may upgrade all fans in the case for better cooling. Cons: Noisy at high and even medium . A bit pricey . Pros: 3 speed switch , fairly silent , works as advertised . It keeps my case cool. Double ball bearing. Just bought this to replace an Antec true quiet fan that came with my P160 case. I am happy with it and would buy it again. Cons: Kinda loud on high. Pros: Move an insane amount of air. These are great fans, they move a ton of air it's actually pretty crazy. They are rather loud on high (when you have five in the tower) so really not much of a con. Having the 3 speed settings just allows you to set it for what ever you need. Didn't want a fan controller in front. I mounted 1 on the side panel intake and 1 on the bottom intake. Mother board controls the other fans so can now set them all to low for quiet use or high when playing games.Temps in the Coolermaster Elite 371 ATX Tower Case are very low. I'm happy with purchase ,would buy again as needed! I wanted cheap case fans with no LED and relatively low noise. This fit the bill really well. I put them on slow all around in my case and it's just fine that way for me. Works well does what a 120mm Fan should, cools components. 3 speed option is a nice perk whilenot on heavy use can be left on low for quiet and put on high under load. Cons: Would prefer these sold in a black mainframe... that's about it! I've actually got two of these fans, got them for free last summer. They work great! For everyone purchasing here, do ignore what people say about these fans not being that good, they actually are fairly good if at the right price. Flexible speed, nice airflow capability. Just to get tihs at $15 would be the killer. But for less than half this price-matched (or better yet, free like I did!) definitely worth it. Cons: fan controller is attached to the fan so cant get at it when inside the case. A great fan that won't let you down. Having a fan controller is a very nice add on even tho you cant get at it when its inside your case. I guess is just a set it and forget it kind of thing. I got this to replace a noisy power supply fan, and will be removing it soon. On medium setting it is the noisiest fan in my PC. On lowest it is quiet but not powerful enough for a PSU. I might use it later as a case fan on lowest setting, it's nice and quiet then.I am running an OCZ vendetta 2 cpu cooler and very quiet fans, so that's why I hear it. This is a great fan from a reliable brand. Installed into my Antec Three Hundred case with no problems. It moves a respectable amount of air and doesn't generate too much noise. An awesome deal if you can get it on sale or price match. I bought 2 to improve airflow for my system. It does what it's suppose to do. SO I have no complaints. The 3 settings may be cool but I usually leave it at one position. Overall, it does it job. Cons: Can be a tad bit noisy of the highest setting. Pros: Quiet (See Weaknesses), Adjustable Speed, Multiple Power Options. Added three of these to my case to help improve airflow. First of all, the fans push alot of air and are fairly quiet except for when on it's highest setting. Also, no annoying LED's and they're clear so that's a plus in my book. Highly Recommended! Cons: May not be the best fan out there. I just bought one of these fans to go to my brother as part of his Christmas gift. I Have an Antec 300 that comes with a 120mm and 140mm black version of this fan and like them very much. I am sure there may be better fans out there, but for the price and flexibility of these fans you can't really go wrong. I am sure that this fan will prove to be just as dependable and functional as the 2 others I already own. Very nice to have the speed selectable switch built in for those of us that don't want to fool around with voltages to get different rpm. Cons: A little loud at 100% but I am not complaining. Pros: Works very well, and quiet. 3 speeds. Includes 2 plug options. Low price. pretty clear plastic. Connectors to work with main board connector or power supply connector. Includes mounting screws. Fan is quiet on low. Has selector for 3 speeds if needed. I have one fan controlled by the main board. It is Running at 900 rpm now and will speed up if things get hot. Always loved Antec fans, especially these speed-controllable ones. On low setting, it's pretty silent. But on medium/high speed, it's somewhat loud, but acceptable in my opinion (you really don't notice it if you're playing games with music on).Would purchase again, and recommend to others. I got this fan with my Antec Twelve Hundred and they seem pretty good. On low, they are silent and still pushes a good amount of air. On medium, they become audible but airflow increases substantially. On high, they become too noisy. They make for good case fans though, so I would definitely recommend, especially because they come with a 3-speed fan controller. 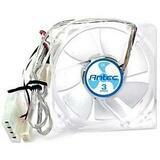 Antec TriCool 0761345-75120-9 balances necessary cooling with quietness. Dimensions 4.72" x 4.72" x 1"